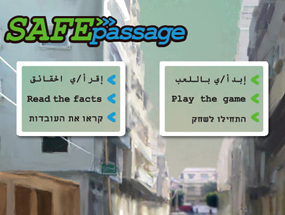 Safe Passage, the largest and most comprehensive new media project about human rights in Israel, allows the user to experience interactively the restrictions on movement between the Gaza Strip and the West Bank and understand the grave consequences resulting from the separation of Gaza and the West Bank for people living in the two areas. Safe Passage makes innovative use of animation, Flash documents, video and a blog, and comprises a political and legal archive, including dozens of official documents that shed light on the military legislation and legal rulings since the 1990s, when Israel began imposing increasing restrictions on movement between the areas. Users can choose one of three figures – a student, a businessman and a family man – to try to get to their chosen destinations. After each character’s bureaucratic “adventures,” the user can watch video clips and get to know the real people behind the characters. And most important – users can impact the situation, not only in the game but also on the ground, by addressing decision-makers. For those who don’t want to play, it is also possible to watch the game as movie. Since the 1967 occupation of the West Bank and Gaza Strip, Israel’s military has developed a complex system of rules and sanctions to control the movement of the 3.4 million Palestinians who live there. The restrictions violate the fundamental right of Palestinians to freedom of movement. As a result, additional basic rights are violated, including the right to life, the right to access medical care, the right to education, the right to livelihood, the right to family unity and the right to freedom of religion. Gisha, whose name means both “access” and “approach,” uses legal assistance and public advocacy to protect the rights of Palestinian residents. Because freedom of movement is a precondition for exercising other basic rights, Gisha’s work has a multiplier effect in helping residents of the occupied territories access education, jobs, family members and medical care. As part of its advocacy work, Gisha reaches out to members of the public and opinion-makers using publications in various media, in order to promote awareness and sensitivity for human rights in the occupied territories. Gisha also advocates directly before decision-makers to promote policies that respect human rights. Gisha is operated by a professional staff and guided by a board that includes legal academics and practitioners, women and men, Arabs and Jews, who have helped shape Israeli human rights law through their advocacy and writings. Gisha is registered in Israel as an independent, non-partisan, not-for-profit organization. Gisha is generously supported by donations from Israel and abroad.